Description: Plots a colored 3-dimensional parametric equation on an HP Prime of the form z=(t,u) where t and u are angular parameters in degrees, generally varying from zero to 360 degrees. Your Prime must be set to Degrees mode in both CAS and Home. The program will also ask for the number of slices in t and u, I generally use 40 for both. The viewing angle for the sample plot is 5 degrees for the x-axis and 25 degrees for the z-axis. 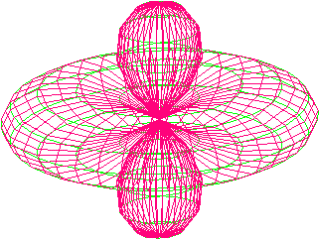 There are sample functions for a toroid (doughnut), sphere, orbital (modulated sphere) and spirals. The program is based on an old Byte magazine article discussing the mathematical principles behind 3D plotting.